Form a bight in the thicker rope (blue) and hold it in one hand. 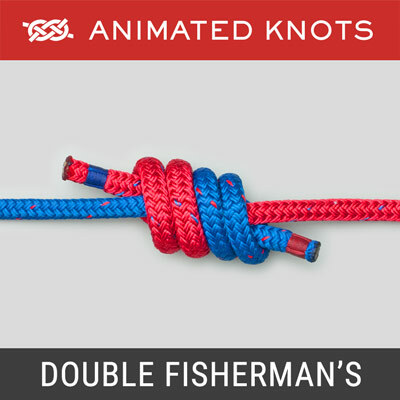 Pass the thinner rope (red) through the bight and behind the (blue) tail and standing ends in that order. Finally, tuck the smaller rope under itself to finish the knot. 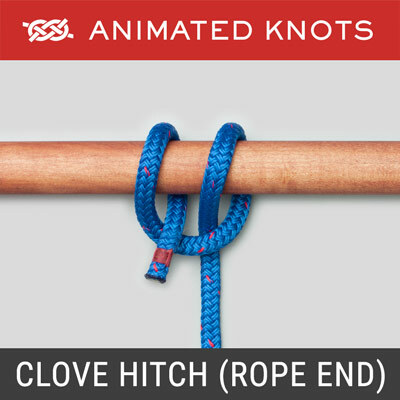 Becket Hitch: The Becket Hitch is a very similar knot. However, it is a "Hitch": it does not join two ropes, it attaches a rope to a Becket (a rope handle or an eye). In the animation the Blue Rope would be Becket and the Red Rope would be tied to it with a Becket Hitch. 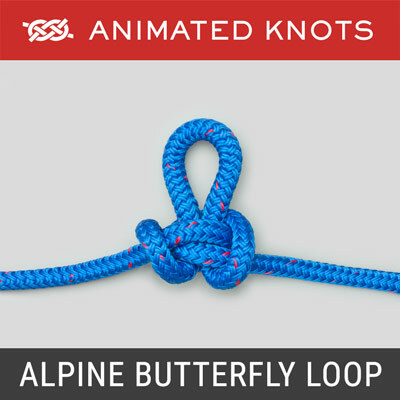 Tying it: The Sheet Bend would replace the Square (Reef) knot except that it is not a binding knot – both ends must be loose in your hands with no load on the ropes. 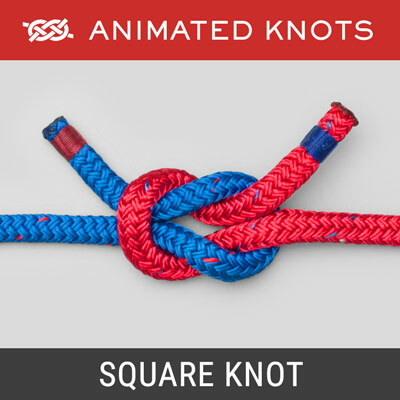 (The Square Knot - with all its faults - can be tied tight against a sail, or parcel, and usually stays tight while the second Half Hitch is tied). The Weaver's Knot is tied in various ways. One way is shown here. A slip knot or noose is tied in the end of the wool. The new piece is threaded through the loop. Pulling on the Noose ends draws the new piece in. 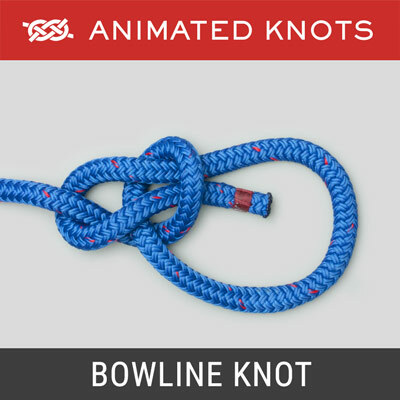 Double Sheet Bend: When the ropes are markedly different in size, the tail of the smaller rope can be taken twice round the bight in the larger rope to create the double sheet bend. 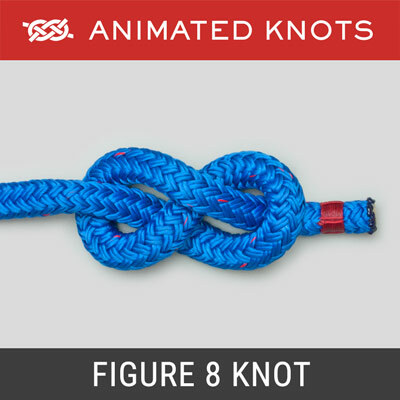 Structure: When correctly tied the two tails lie on the same side of the knot. The alternative version - with the tails on opposite sides - is less reliable. Making a Net with Sheet, or Carrick, Bends: Making a Cargo Net is tedious, time-consuming, and only to be undertaken out of necessity or by the enthusiast. Making a Climbing. or Cargo, Net: In case you ignore this excellent advice, and proceed to make your own net, the image on the right shows a method using the the Carrick Bend. Start: Hang long lengths of rope over a pole. If 20 strands of rope are planned, then hang ten pieces each one hanging either side of the pole. Size: Here three ropes have been used to make six strands (forget color). In practice many more vertical ropes will be used to make it wider, and it will be longer as well. In this picture, colored rope has been used to make it easier to follow the path. Rope Length Needed: It is worth making a test with a short length of rope to determine how much rope is consumed making each square. Side Ropes: The two side ropes consume less length because they do not pass around any squares. They hang straight down and provide a place to secure the rope coming across. It is preferable to twist them around each other in a spiral before starting the knots in the next row. This same treatment can be applied to the double rope at the top. This works best if one piece of rope is used to make a border around the whole mat. Making a Net with Three-Strand Rope: Commercial nets are commonly made using three-strand rope. Junctions: At each junction the ropes are passed through each other. This technique is quicker and neater and consumes less rope. Each rope must be inserted through the other to wrap around two strands of the other rope as shown. Border: One rope around the entire circumference makes the final product neater and a Short Splice can be used to join the ends after the netting is completed. Verticals: As before long lengths of rope are used to make each pair of verticals. Each rope is threaded through the rope at the top several times to achieve spacing. Sides: As each horizontal rope reaches the side it is threaded through the circumference rope several times to create spacing. Just as with the Junctions, the rope enters and leaves around two strands of the border rope. Decorative Net: This complex and beautiful net was seen in a Marriott Hotel in Austin TX. Framed sections of the net were used to create separate areas in the lobby. Junctions: Each junction is made up of a Square Knot which is tied around two other strands. In the row below, the role is reversed and the Square Knot is tied using the other ropes.